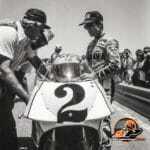 King Kenny Roberts gets ready to practice at Laguna Seca in the 1980s. Spoken wheels era. 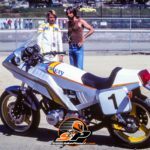 Craig Vetter and his hair, and “mystery ship” at Laguna Seca in 1980. King Kenny, Ferrari 308 GT-S, Laguna Seca, 1980. Personalized plate and very, very long toes. The King’s race bike stripped down and awaiting attention. Laguna Seca 1980. 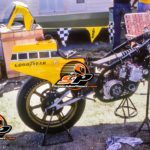 The Legend’s pit area, Laguna Seca, 1980. Kel Carruthers does the way TMI. Jim Doyle, Laguna Seca, 1984. Doyle was Roberts’ first manager and went on to manage Randy Mamola. Roxy Rockwood does the questions. 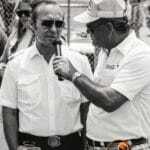 Keith Code interviews the King, Winner’s Circle, Daytona 200, 1983. Way in back is the man most responsible for Roberts’ success: Bud Aksland.